One of the aspects I particularly like about kumihimo is that there is always so much more to learn. Not only are there hundreds of different traditional braid structures to try, but there are so many new ways of adapting traditional braids to comtemporary jewellery waiting to be discovered. Yesterday I spent the day teaching at a workshop, so I am going to devote today to learning. First on the list is a new YouTube video from Mariella Catz for the Chidori braid. I had never even heard of the Chidori, so I was very excited to give it a go. Mariella’s videos are very clear and easy to follow and I really enjoyed learning this braid. I am very pleased with the end result and all I need to do now is add the ends and fastening. Now for another one …! The majority of disk users only ever make one braid on their disk. As the braid in question is Round Braid or Kongo Gumi it is not surprising because this is a wonderfully versatile braid, which is easy to learn and lends itself well to both plain and beaded braids. Once you move beyond Round Braid the structures become more complex and this is understandably offputting for some braiders, so I thought it might be helpful to put together some useful advice for learning a new braid. YouTube videos are the easiest way of learning for most people, so my suggestions refer to that method, but they can be followed in much the same way for written instructions, if you prefer. Everyone learns at a different pace, so choose a time when you can work for as long as you need to without having the pressure of needing to dash off somewhere else at a set time. Ensure that the environment is peaceful. Soft music is ok, but the television or other people talking is not ideal. Don’t allow yourself to be distracted by the phone or social media. Use a cord which works up fairly quickly and which provides defined ‘stitches’ in the braid, such as satin cord or rattail. Watch the video for the first time through from beginning to end without stopping, so you know what you need to end up with and you have picked up on all the advice given. Fast forward to the braid moves and watch that section through several times, trying to follow and understand the sequence of moves. Try to feel the rhythm of the braiding and take note of the shapes the cords form on the disk. 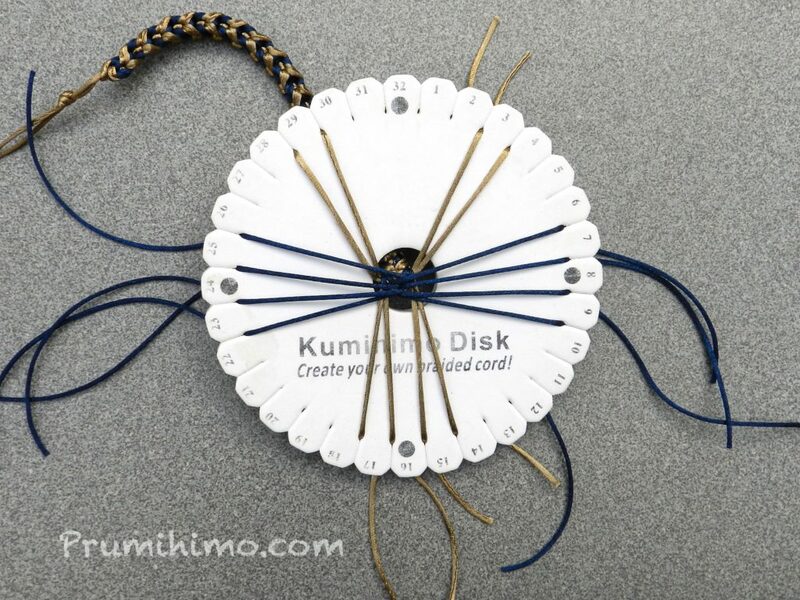 Kumihimo braiding is generally very symetrical, so a move will be followed by a similar move on the other side of the disk. Be awar of the symmetry. Set up your disk and work through the moves, stopping the video as necessary. As most moves are performed in pairs try to watch two moves, stop the video, perform the two moves and restart the video for the next two moves. Continue to work with the video for as many times as necessary. You should gradually start to feel the rhythm of the braid and start to remember the moves. Do not rush these repetitions because with each one you will remember more. When you feel you know the moves try again with the video, but this time perform 2 moves and then watch the video to check that you got them right before continuing. If you are correct all the way through, try 4 moves in the next run through before checking. Then try 6 or 8. This part is all about building your confidence and retaining what you have learnt. When you feel ready to go it alone, braid for a few centimeters without the video. If you get a bit lost, just reset your cords and repeat steps 7 and 8. Don’t try to correct your mistakes in the braid. Reverse braiding can be confusing and disheartening. You should regard your first attempts as a practise braid and not give yourself the pressure of feeling you have to make it into something. Once you feel you have mastered the braid, try to carry on for as long as possible, so that the moves, the rhythm and the shapes are firmly fixed in your memory. Try it again several times over the next few days and weeks. Congratulations! You now have another great braid in your repertoire. If you would like to have a go at the Chidori braid click here. Don’t forget to check out all the other great braids on Mariella’s channel.